Yes, summer has gotten away from me. LOL While I've been out enjoying it all, I haven't been writing about it as much. 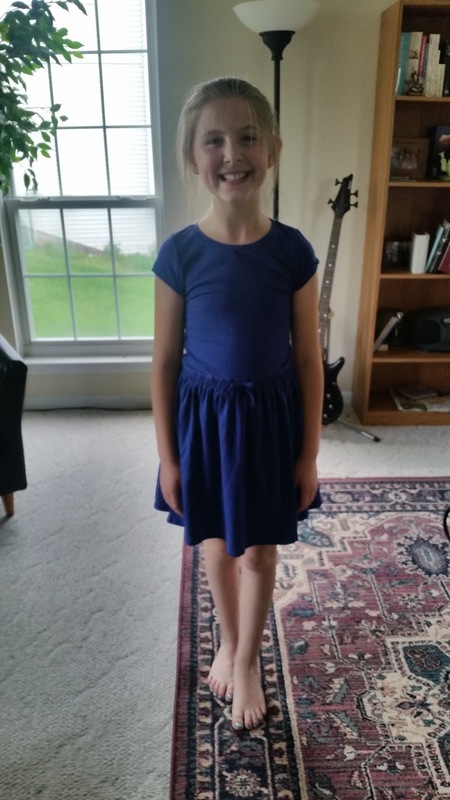 Kidpik is still my daughter's wardrobe of choice, and they've even started a referral program, so you can use my link for $15 off your first box! I've got our spring/early summer box to tell you about now, and we just received another box for fall, so I'll bring you up to date on that one in the next week or so. This is Maggie wearing the Hello Lace Tank in white. It's regular retail is $15.50, so if we had kept the whole box, it would have been $10.85 with the 30% discount. We did keep this shirt, and she's gotten plenty of wear out of it this summer. The different shades of blue in the print on the shirt made it go with her denim shorts super cute. We kept it. The second item (and third, as it turns out) are a few she plans to wear to a wedding party tomorrow. It's the Garden Floral Flutter Dress in multi ($27.50 regular price, or $19.26 with the discount) which she's wearing here with the Beth Perforated Ballet shoe in white ($17.50 regular price, or $12.25 with the discount). Adorable! 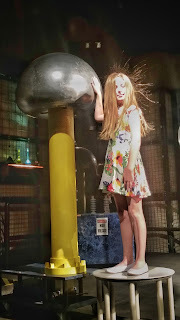 The picture here is at our local science center the day after the box came - she couldn't wait for our regular fashion show pictures. All of her dresses have been looking a little short to me lately, but I think that's the fault of her long legs. Hahaha... We solve it by always wearing biking shorts underneath in case she forgets how to sit still. This is a great summer-weight dress with a light lining. We kept it. She hasn't worn the shoes as much, but there's not a lot of call for ballet flats on a kid in summer. I think she'll get a lot more use from them now that school is starting back. 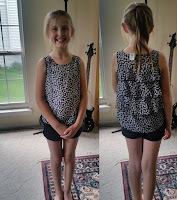 While I thought this Mini Floral Ruffle Back Top was super cute on her, she insisted the 'mini' in the name applied somehow to some of the measurements - it was a little snug in places and not very comfortable to get on and off. It's regular price would have been $17.50, or $12.25 with the discount. By her grumbling and squirming during the fashion show, I knew she'd keep finding excuses not to wear it again, no matter how cute I thought it was. We sent it back. The last thing she tried on from this box was the Drop Waist Dress in Mazarine Blue (regular price $14.50, or $10.15 with the discount). I just didn't think this one was very flattering on her. Add that to the fact that she doesn't wear a lot of dresses anyway, and this was in the bag on its way back right away. 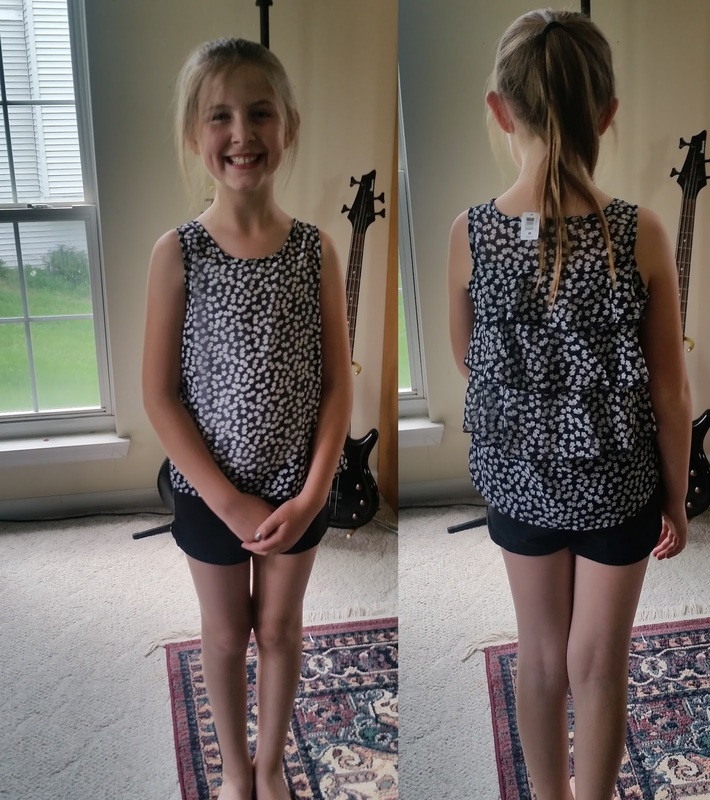 Besides these things, she also got a plain seamless tank in white (she wears camisoles and things like this nearly every day, so we kept it), and a pack of ponytail holders. Those things grow legs, so we collect as many as we can! Overall, it was another successful box to give Maggie some new goodies to wear on her way into summer, and keep me out enjoying the beautiful weather instead of in stores hunting down something we could agree on. Have you tried Kidpik yet? It's a super-fun, risk-free way to possibly get some shopping done without leaving home! They authorize your card but charge you nothing to ship it out to you, and they include a postage paid shipping envelope to send back anything you decide not to keep! One better, there's always a free gift (this time it was a bag of pins she's happy to be putting on her backpack). Even if you send back everything, you keep the gift. Use my link to get $15 off your first box! And let me know what you think of your box. There are so many subscription boxes/ideas nowadays! I haven't even heard of Kidpik, seems useful if you have kids though :). I'd like to try it for my 3 year old. Do they go that young?